Heating a building can be quite the challenge. There is much talk in the industry about the importance of upgrading windows, sealing cracks, improving insulation, and overall preventing heat from escaping from the building, but what about allowing this heat to permeate the room in the first place? Often times boilers are turned up in order to accommodate for a few cold suites, but this may not be the best solution. Despite being one of the most important parts of the heating system, baseboard radiators are out of sight and – all too often – out of mind. Although commonly referred to as “radiators” or “rads”, baseboard radiators are in fact also convectors, using thin metal fins to transfer heat to the air via convection. 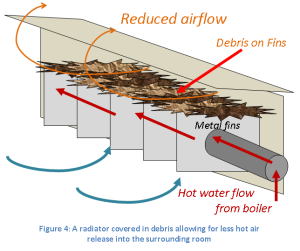 These metal fins absorb heat from the hot water pipe which runs through the center of each fin and transfers this heat to the cool, dense air which is pulled in and up from the floor. This circulating air is heated, effectively warming the room (Figure 1). 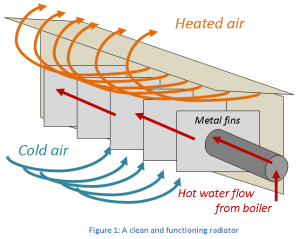 How well a radiator functions therefore depends directly on air flow around the fins inside the unit. 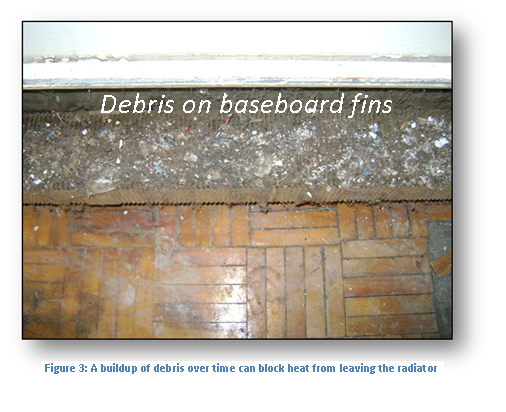 If these fins are blocked, air is not flowing and heat is not being delivered to the suite. Air flow around the fins can be blocked based on a number of factors. The most visible include furniture or other items being pressed up against the radiators, or heavy drapes hanging over the radiator to the floor. 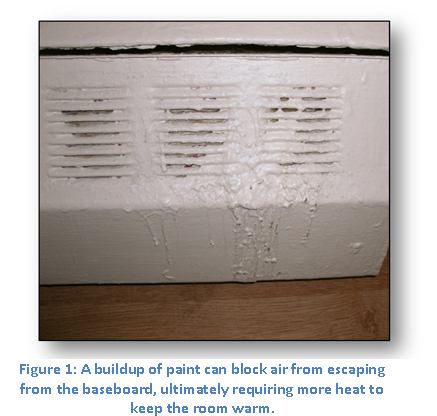 Heavily painted radiator covers can also act as a barrier. They can prevent the heated air from moving out into the room, just as a piece of furniture in front of a radiator would (Figure 2). All of these examples will act as a blockage from allowing the air that is warmed around the fins to be transferred to the rest of the room; the less obvious issue is on the fins themselves. 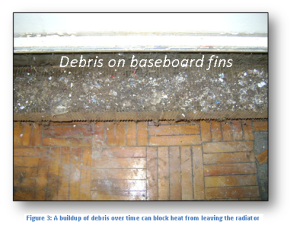 A build-up of debris overtime on the fins of a radiator can be even more detrimental to heating a space than almost any other factor. Over time, dust, pet hair, and other small particles can accumulate on the fins and begin to act like a thermal blanket (Figure 3). They keep the fins so well insulated that heat cannot be transferred to the surrounding air, effectively creating a cold zone (Figure 4). Often times the heat is turned up overall to accommodate the minimum in-suite temperature requirements, but this can lead to overheating in other areas of the building where there are clean fins. Increasing the supply water temperatures also increases distribution losses throughout the heating system. By adjusting boiler temperatures down to optimal rates and keeping the fins and radiator covers clean, the system as a whole will be able to function as it was designed. This will not only keep tenants happy, but will reduce overheating in the building, reduce the load on the boiler system, and reduce gas consumption and costs of heating the building overall. Even with a top-of-the-line boiler system in place, ineffective radiators will prevent even and efficient heating of a building. It is easy to overlook the health of the radiators in a unit as they are almost always covered, and as such are assumed to be functioning without issue. By regularly maintaining the air circulation around the fins inside the radiator, combined with a building automation system that is able to compensate for temperature changes, the true effectiveness of the heating system in a building can be harnessed and substantial savings can be realized. Some companies, such as Novitherm, provide a service of cleaning fins and installing heat reflectors behind the radiators. The savings from regular maintenance can be further enhanced with the incorporation of a building automation system. At Watershed we use both historic and daily data to monitor, assess, and manage the boiler system in the building, ultimately painting a very clear picture of how the system is functioning as a whole. We are able to fine-tune the boiler so that it is working at optimal levels while preventing overheating and wasted energy. Our system combined with maintaining the radiators in each suite will not only provide detailed information of how your building is doing, but it will save you time and money in the long run.